Definition at line 1408 of file stdsoap2.h. Definition at line 1410 of file stdsoap2.h. Referenced by http_parse_header(), soap_begin_recv(), soap_clr_mime(), soap_count_attachments(), soap_end_recv(), soap_envelope_begin_out(), soap_get_mime_attachment(), soap_getmimehdr(), soap_init(), soap_puthttphdr(), soap_putmime(), soap_putmimehdr(), soap_select_mime_boundary(), soap_set_mime(), and soap_valid_mime_boundary(). Definition at line 1413 of file stdsoap2.h. Referenced by soap_attachment(), soap_begin_recv(), soap_clr_mime(), soap_count_attachments(), soap_end_recv(), soap_end_send(), soap_get_mime_attachment(), soap_init(), soap_putmime(), soap_set_mime(), soap_set_mime_attachment(), and soap_valid_mime_boundary(). 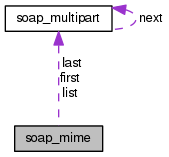 Referenced by soap_attachment(), soap_begin_recv(), soap_clr_mime(), soap_end_recv(), soap_end_send(), soap_get_mime_attachment(), soap_getmimehdr(), soap_init(), soap_set_mime(), and soap_set_mime_attachment(). Definition at line 1412 of file stdsoap2.h. Referenced by soap_begin_recv(), soap_end_recv(), soap_end_send(), and soap_init(). Definition at line 1411 of file stdsoap2.h. Referenced by http_parse_header(), soap_begin_recv(), soap_clr_mime(), soap_envelope_begin_out(), soap_init(), soap_puthttphdr(), soap_select_mime_boundary(), and soap_set_mime().